The Self-Confessed Geek: Pocket Cinema: Is That a Movie Studio in Your Pocket or Are You Just Pleased to See Me? Pocket Cinema: Is That a Movie Studio in Your Pocket or Are You Just Pleased to See Me? The promise of the HDSLR is the democratization of video and film making. The idea that, that new DSLR you just bought for stills can make amazing HD video files so why don't you just start making a movie? The reality is, before you begin you need to buy a new tripod and head, rail system, matte box, follow focus, video monitor, viewfinder, shoulder mount, sound recorder, microphones, lights, computer and software if you want to take it seriously. And that's just the gear: there are new technical skills to learn and you can't man all that gear yourself so you need help, plus you need something to work on worthy of all that expense and hassle and suddenly that promise of anyone being able to make a movie get's paralyzed by the work and expense involved. Which is why I was inspired when a friend suggested I listen to a BBC radio program on Pocket Cinema. Sadly the show isn't available for you to listen to anymore but the nub of the show is what creative filmmaking people are achieving with the the most modest of gear; a Flip or their cell phone or, at the very most, a consumer camcorder. 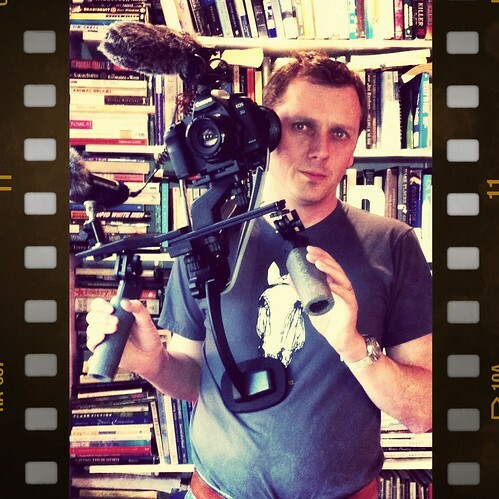 Little in the way of crew or gear or hassle - filmmaking in its loosest, cheapest most accessible form. Visiting the French Pocket Film Festival mentioned in the BBC Radio piece shows a diverse representation of what Pocket Cinema is. Viewing the prize winners, Pocket Films are pretty avant-garde but I wouldn't expect any less from the French. A couple worth viewing as a taster are Turbo 2008, Home and Much Ado but you can loose a lot of time exploring the entries. This led me to The Disposable Film Festival for an American point of view. Again, exploring the entries and winners is inspiring and redefines what filmmaking is. We live in interesting times. Blockbusters cost more than ever to make. More 'films' than ever are being made as the cost of making an indie comes down. The opportunities to make a living making film or video are fewer and harder than ever to break in to. We watch fewer movies in a theater, we watch less live TV but we spend more screen time than ever before. Video on demand is almost ready for prime time. We can watch more stuff for free. We watch 'movies' on our phones although the average maximum time anyone one can concentrate on a phone movie is 9 minutes. The short of it is, times for low/no budget filmmakers are changing at a rapid pace. We've had the best camera is the one that's with you movement for stills so why not have the same thing for filmmaking? Looking at all those pocket film festival entries you see people not waiting for creative or practical permission to make movies. You see creative people making art, narrative and documentary movies with the closest tool to hand: their cell phone. A device so ubiquitous than no one will blink an eye if you take it out and start shooting footage. This was the promise of the HDSLR but, in my experience, even the lightest run and gun HDSLR rig attracts all sorts of attention when you take it out in public. It is liberating not to have to consider exposure, white balance or even pulling focus - the iPhone won't let to adjust any of those things so you can just get down to the business of capturing footage. That's not to say that you should forget all you have learned, you just need to apply it differently. Just because it's acell phone doesn't mean that footage has to be shaky and badly framed. In fact, the easiest way to make your pocket film footage stand out is to use some support. 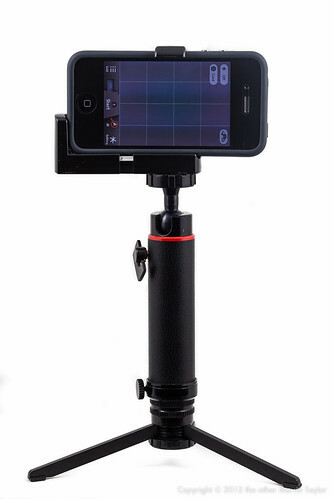 Mounting you iPhone on a massive fluid head may be over kill but a cheap tabletop tripod for locked down shots is useful and you can use it as a handle when you're moving around so that you don't have to hold your iPhone in the double finger pinch grip. I'm inspired enough to start shooting more video with my iPhone. If that results in something that's great but if it doesn't I have lost nothing. I already have the iPhone with me so why not use it? I can only learn more by doing even if I don't have permission from anyone yet to call myself a filmmaker. Woo, the Steadicam Smoothee looks cool but get thee behind me satan - tempting me to buy more gear - I will blame you when Patti goes through the credit card statement and sees charges to NY camera houses on it. I'm going to have to buy an iPhone...at the moment i'm making a dance video with my daughter using her flipcam and her editing skills (i can't dance, though that's sort of the point, but i'm hoping she'll stop me looking completely ridiculous!) i was so inpsired by the BBC programme. Glad you liked it too. Thanks Sarah - I was totally inspired by the idea of pocket cinema.